THE GOLAN HEIGHTS (in Arabic, Al-Jaw-lan) is a hilly region in southwest SYRIA, bordering nearby regions of LEBANON and JORDAN, with a highest point of 7,297 ft (2,224 m). The area is one of the most heavily disputed areas in the history of the 20th century. 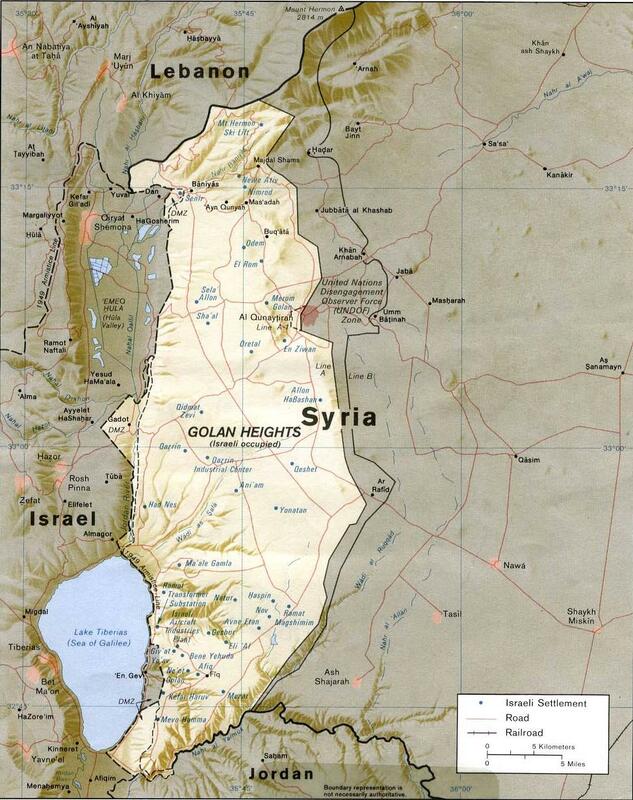 When the state of ISRAEL emerged after the vote of the United Nations and the war of independence in 1948, the Golan Heights, under Syrian rule, were used as a military tactical point against Israel. Up to the war of 1967, Syria used the Golan Heights to attack Israeli villages from the Sea of Galilee to the Lebanese border with sporadic artillery fire. The Golan Heights were heavily fortified by the Syrians, but the Israelis were informed about these activities by their master spy, Elie Cohen. The Israelis were able to take the Golan Heights in little more than 24 hours during the 1967 war, and the Syrians lost their decisive strategic asset for shelling large parts of northern Israel. In the war of 1973, the Israelis were taken by surprise, including on the Syrian front. After heavy losses, the Israelis, in an unprecedented turn of the tide, drove out the conquering Syrians and were only stopped by political pressures from the UNITED STATES to go all the way to DAMASCUS, the Syrian capital. After political negotiations brokered by U.S. Secretary of State Henry Kissinger, Israel and Syria signed a disengagement agreement in 1974. The Israelis gave back the Syrian land conquered in 1973 and even part of the Golan Heights area (especially the city of Kuneitra). The economic importance of the Golan Heights is negligible (apart from some tourism, including winter sport facilities in the Mount Hermon area), but the strategic importance of the Golan Heights is gigantic. By its prominent position, the Golan Heights can control many parts of northern Israel. Therefore, the Israeli parliament made the Golan Heights part of Israel in 1981. U.S.-brokered negotiations in the 1990s for a peace settlement between Syria and Israel failed, as the Syrian side demanded the return of the Golan Heights before any peace settlement, and the Israeli side ruled out discussions on a change of sovereignty of this strategic asset without any durable peace settlement with Syria. The Golan Heights remain a hotspot of international tension and could well become the setting for another war, although the area has limited immediate military presence as a consequence of the agreements of the 1970s.